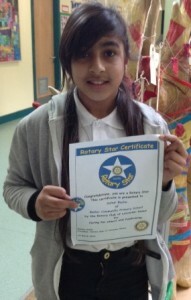 Show a good attitude towards schools. An opportunity to recognise and reward young people from outside the normal school curriculum. 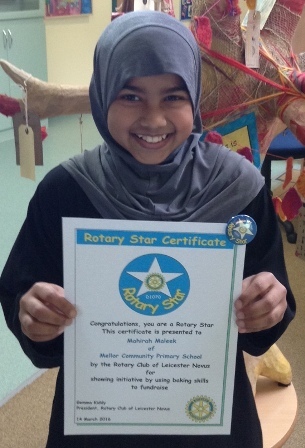 In setting up the citizenship project, Pam made herself available to speak to school teachers about what Rotary hoped to achieve. 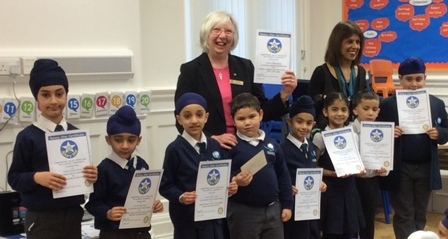 And then on March 14, she attended a Celebration Assembly at Mellor School in Checketts Road to present certificates and Rotary Star badges to all 15 shortlisted pupils. 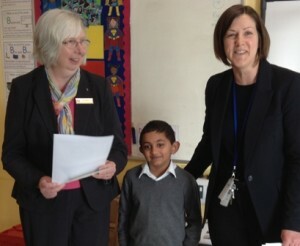 The overall winner was six-year-old Neil Patel who also received a £5 gift voucher. 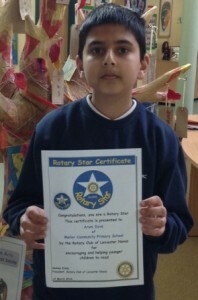 Neil was nominated by his teacher, who said: “Neil saw a boy outside who did not have anybody to play with. Without being asked, Neil sat with him for the whole of break time to make sure he wasn’t alone. 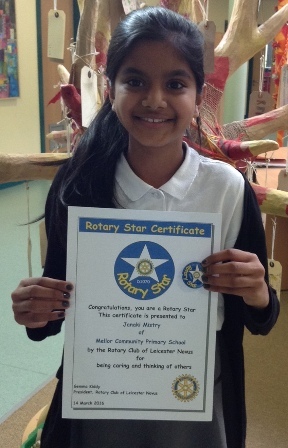 Neil did this without being asked and did not tell me about when he came in. Another staff member saw it and told me about it. I was delighted to attend another Celebration Assembly, this time with Jasbir at Falcons Primary on 24 March. 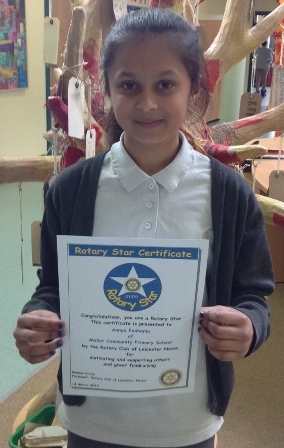 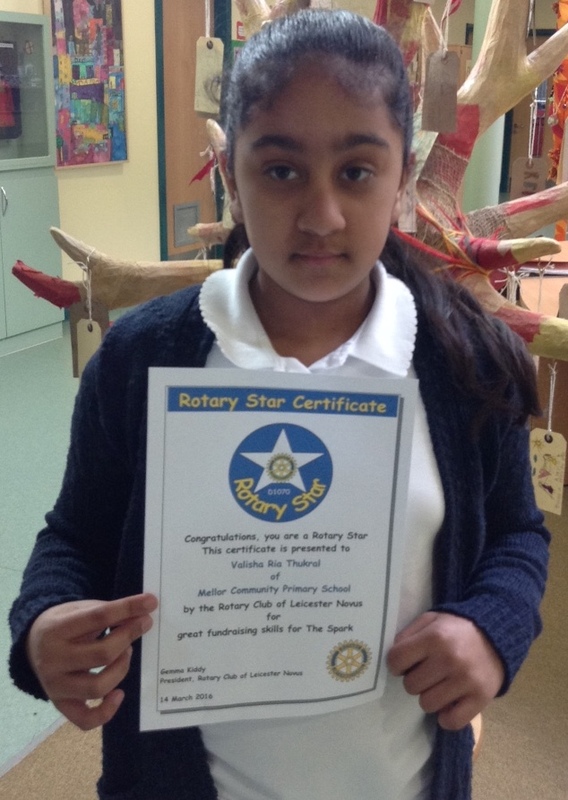 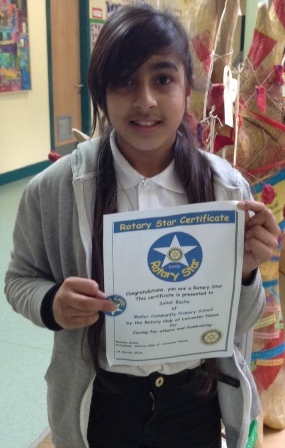 We had received nominations from nine pupils, all of whom received a Certificate and Rotary Star badge. The overall winner was Marian Bendik (aged 6) who also received a £5 gift voucher. 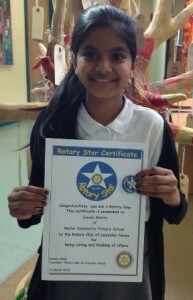 Falcons Primary will be submitting more candidates in the Summer Term.